Seemingly out of the blue, a music festival lineup began making its way through Facebook on Saturday. First, Kongos posted about it. Then, Bastille followed suit. 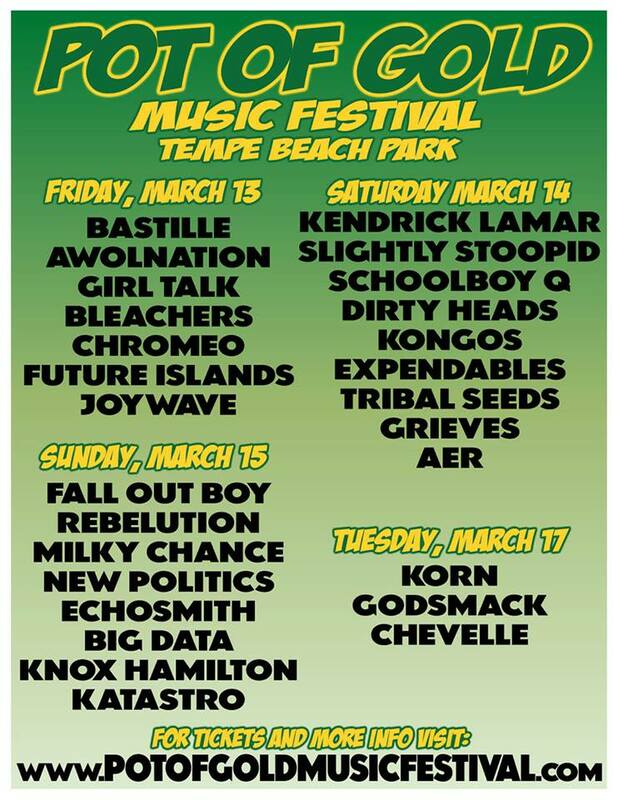 It’s called the Pot of Gold Music Festival, to be held March 2015 at Tempe Beach Park. You know, that place where the Summer Ends festival took place and was subsequently rained out and relocated to Marquee Theater? We shouldn’t expect anything like that to happen for Pot of Gold, though; this is well-timed. The weather is perfect, and it takes place right before McDowell Mountain Music Festival (usually held the first weekend of April). The difference between Pot of Gold and McDowell Mountain Music Festival? Pot of Gold is all about that indie music — and a lot of it. Oh, and reggae, too. And did you see Tuesday’s lineup? Holy, Chevelle. Where have you been? Cartel and Lux Coffeebar, expect Friday and Sunday to be slow, slow days for you. It’s predicted most, if not all, of your patrons will be at Tempe Beach Park getting their indie fix. Bleachers, anyone? And here’s a first: Pot of Gold already has the set times up… a whole 5 months ahead of time! As for ticket prices, it was listed on their homepage last week as $29 each day, but they’ve since taken down the prices. Tickets go on sale October 31st, so be sure to hop online to grab a ticket or two. Follow Pot of Gold’s Facebook page for updates.